Happy Friday MMT Family! I am so excited to finally write about Open Road films’ DOPE – which so far is my absolute favorite film of 2015! If you’ve heard anything about it, I highly doubt that it was bad as writer/director Rick Famuyiwa (The Wood, Brown Sugar) has truly changed the game on the “high school dramedy” – with a proper dose of social commentary thrown in for good measure. The film – produced by actor/director Forest Whitaker – was also a breakout hit at this year’s Sundance Film Festival. 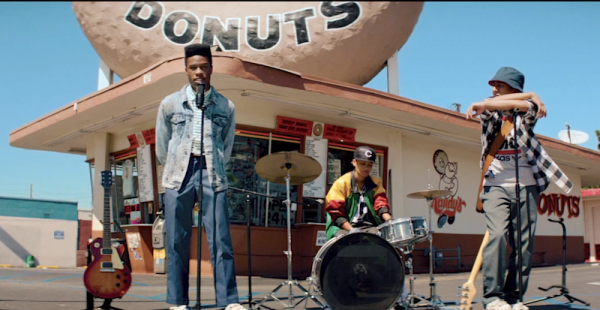 DOPE follows the journey of high school senior Malcom (Shameik Moore) and his fellow misfit friends Jib (Tony Revolori) and Diggy (Kiersey Clemons) – from their unknowing entry into a drug scenario (slight spoiler) through their clever attempt to beat the odds and the drug dealers at their own game. Famuyiwa focuses once more on his beloved Inglewood, as with his critically acclaimed feature The Wood, which works brilliantly with the commentary on race, stereotypes and identity in the film. I really enjoyed the star cameos – which included Kimberly Elise (For Colored Girls, John Q) and Roger Guenveur Smith (Cover, American Gangster). As well as rapper A$AP Rocky in a very comical screen début, and a performance by the extremely talented Zoe Kravitz (Insurgent, Yelling to the Sky) who really has shined in several films in recent years – and come into her own nicely (her band Lolawolf included) outside of her famous parents’ (Lisa Bonet and Lenny Kravitz) notoriety. It was also great to see actor D’aundre Bonds (Gangster Squad, The Wood) – who had a couple of pretty funny moments as a high school security guard. Add to that the 90’s hip-hop score curated by executive producer Pharrell Williams – who also created four original songs for the film – and DOPE conjures up feel-good nostalgic memories interspersed with laughs that are plentiful for the taking. And you know we don’t do too much spoiling on this site, but just know that social media and technology is ingeniously highlighted in DOPE, including the online currency site Bitcoin, so it is fitting that this is the first film to accept Bitcoin payment for ticket purchases. Alright MMT Fam, if I keep writing I will start giving spoilers – I enjoyed the film that much! I need to come up with a rating system for the MMT site! Any suggestions for symbols? Let me know in the comments when you share your thoughts on the film! I agree with you! I had my doubts about this film. A buddy dragged me to see it.lol But it was much better than I thought it would be. A pleasant surprise! It’s now on Netflix! Now I get to replay! 😉 Thanks for sharing your thoughts!